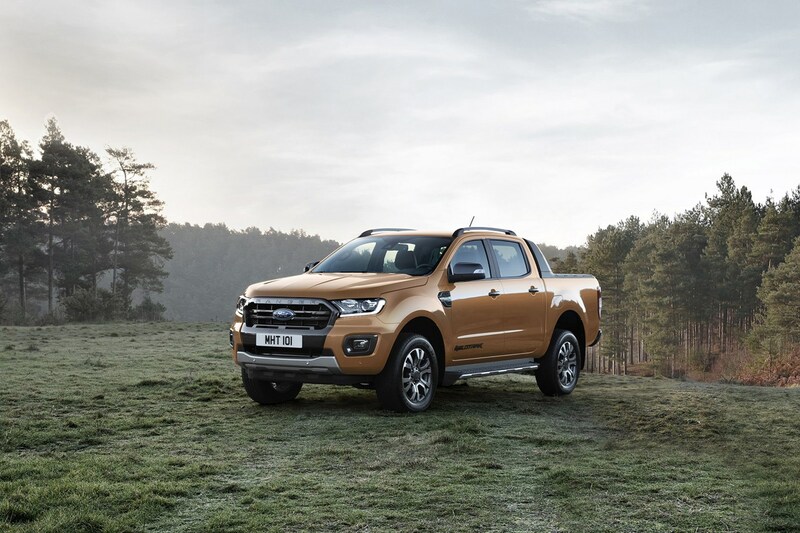 Meet the new 2019 Ford Ranger facelift – it may not look much different, but this is one comprehensively updated pickup. We’ve got all the official details and pictures right here, including the price and info on the brand new 2.0-litre EcoBlue diesel engines, which deliver up to 213hp. The performance of these engines is demonstrated in a tongue-in-cheek promo video we've included below. 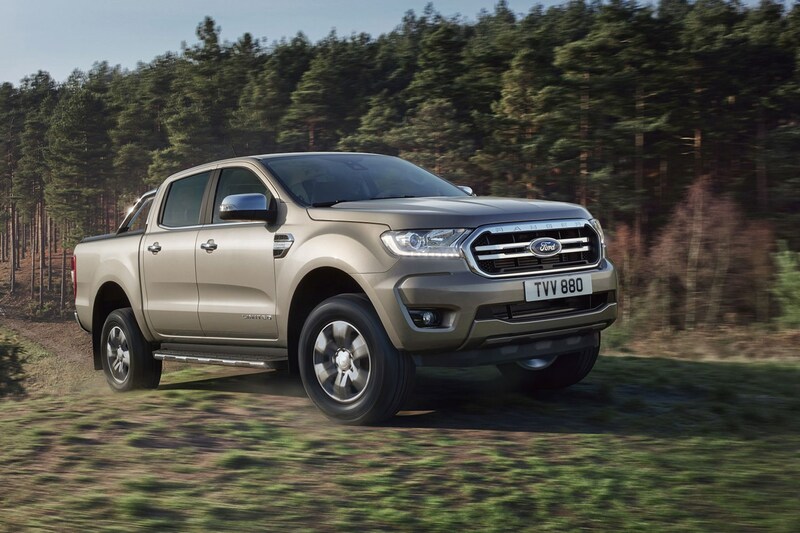 So just when you thought Volkswagen and Mercedes had the fancy end of the pickup truck market sewn up, along comes Ford with a thoroughly upgraded Ranger, crammed full of cutting-edge equipment. Not only is there a whole new set of engines, which together with a new 10-speed automatic gearbox promise up to 9% better mpg, Ford is also introducing high-end features including standard-fit autonomous emergency braking with pedestrian detection (a class first), optional FordPass Connect on-board Wi-Fi, and even active noise cancelling to improve the refinement of top spec models. The Amarok and the X-Class suddenly seem rather under-equipped… And that’s before you even consider the high-performance Ranger Raptor, which promises to deliver high-speed off-road capability like no other pickup on sale in Europe. The biggest news here is surely the engines. Gone are the old 2.2-litre four-cylinder units, replaced by brand new 2.0-litre EcoBlue four-cylinder motors, similar to those already used in the Ford Transit and Transit Custom. This won’t immediately seem like good news to some people – not only do pickup buyers typically favour large engines when available, the EcoBlue units have had a bit of a tough start in Ford’s vans, with some widely reported oil service issues. However, by this point such problems should have been ironed out, and it’s not as if the 2.0-litre engines are shy of performance. The top whack 213hp version not only has 13hp more than the old 200hp 3.2-litre five-cylinder Ranger, it also boasts an extra 30Nm of torque, enhancing its load-lugging capability. Note that the above mpg figures are the initial estimates, and may actually improve for some models in production; quoted CO2 has certainly fallen since the initial round of information was released in January 2019. All the new engines meet the latest Euro 6D Temp emissions regulations. The 3.2-litre engine has also been made capable of complying with Euro 6D Temp, and continues to be available - but only in the Ranger Wildtrak, as an option alongside the 213hp 2.0-litre. Even the single-turbo 2.0-litre engines are said to provide quicker responses for ‘a light and more urgent feel across the rev-range’, while the sequential turbocharging of the bi-turbo engine uses a small turbo to get things going, handing over to a larger, variable-geometry high-pressure turbo for top-end performance. And while it’s no match for the power and torque of the V6 engines available in the VW Amarok and Mercedes X-Class, it will certainly weigh less, which is another way of improving performance. The new engines use selective catalytic reduction (SCR) with AdBlue to control harmful emissions. 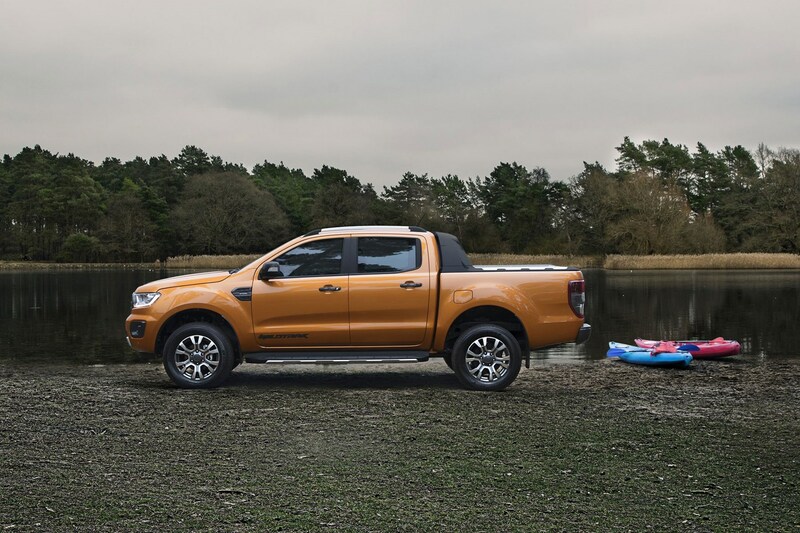 All versions of the 2019 Ranger are fitted with four-wheel drive and a six-speed manual gearbox as standard, with a 10-speed automatic available on the 170hp and 213hp versions. The 200hp 3.2-litre that's still available in the Wildtrak carries on with the old six-speed automatic if you don't want it with a six-speed manual. The new 10-speed automatic is said to deliver real-world fuel economy gains of up to 9% (when combined with a manual gearbox, the new engines apparently manage a 4% improvement, thanks to their friction-reducing design), and this is the same auto transmission that’s also used in the Ford F-150 American pickup and the Ford Mustang muscle car. The 10-speeder is designed to be a highly adaptable gearbox, adjusting its shift program to best suit the type of driving you’re doing at the time. Clever stuff. As before, the 2019 Ranger is available in Regular Cab, Super Cab and Double Cab body configurations – the first two more commonly known as single cab and crew cab variants. Similarly, the XT, XLT, Limited and Wildtrak trim levels carry over from the previous version, with the addition of the new Raptor at the top of the range. The new Ranger is based on the existing platform, which has been on sale since 2011, but boasts a new-look front end thanks to a revised bumper design and new grille. Bi-xenon headlights and LED daytime running lights are fitted to posher models. There are also some new paint choices, including Diffuse Silver and Blue Lightning, while the popular Ranger Wildtrak lifestyle model is available with an exclusive Saber Orange hue, complete with contrasting titanium-effect exterior accents for the grille, door mirrors, door handles, side air vents and load-bed rails. The Wildtrak also gets dark satin chrome trimming on the inside, complemented by a ‘gloss finish decorative spear’ (not an actual throwing or stabbing implement) and part-leather seats with Wildtrak graphics. 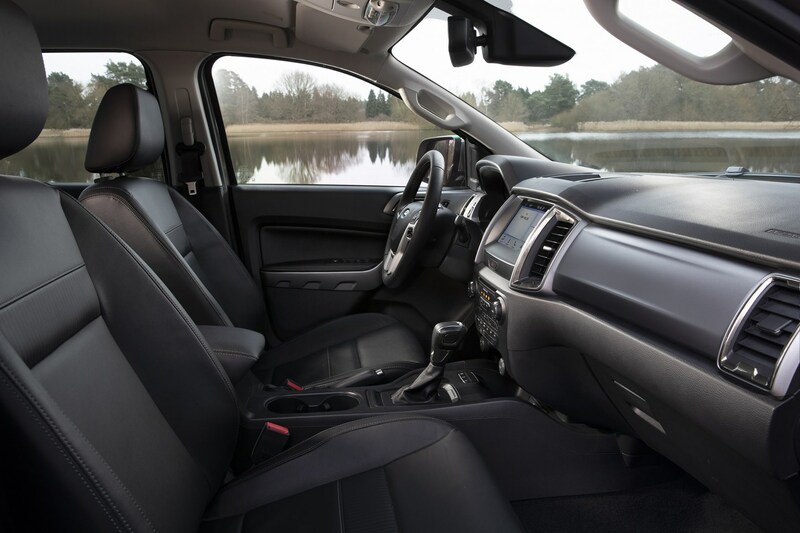 All 2019 Ranger models benefit from Ebony Black interior trim, and greater ‘depth and shine’ to painted surfaces. 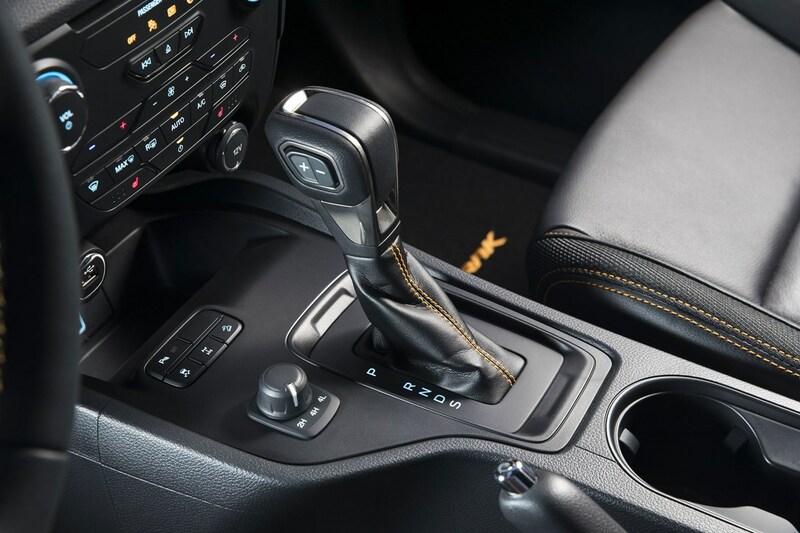 The 10-speed auto also gets what’s described as a ‘more upscale’ shifter knob. 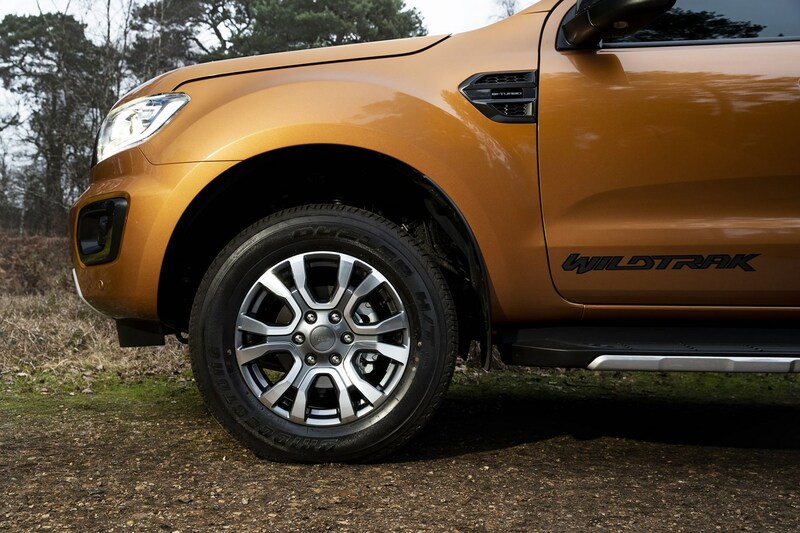 Ranger Limited includes black leather seats and an ‘exclusive’ 17-inch alloy wheel design. 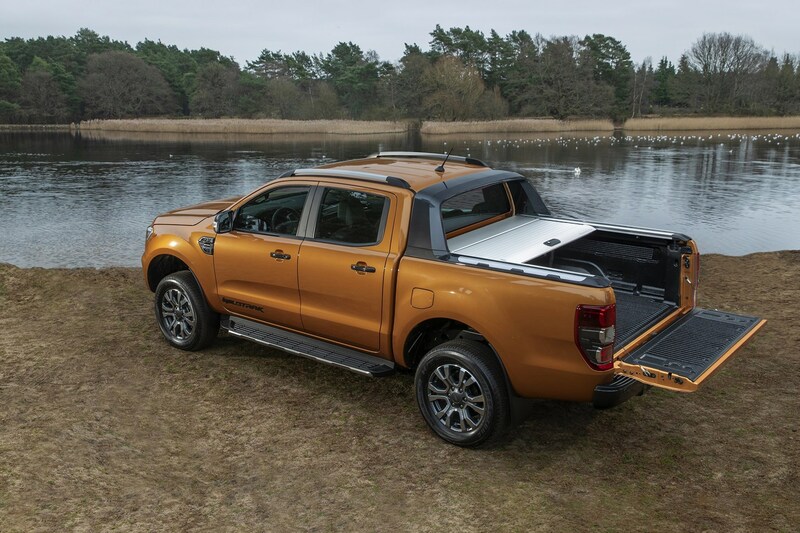 Both the Wildtrak and the Limited come with a new ‘easy-lift’ tailgate, which features a torsion bar to reduce the effort required to close it. Ford has jammed the new Ranger full with new high-tech equipment and options. The item that first catches our eye is the Active Noise Control technology fitted on the most powerful Double Cab variants – this should substantially improve the in-cab refinement, and therefore passenger comfort levels. An excellent concept that we look forward to testing. Similarly excellent is the news that Ford is fitting the Ranger with autonomous emergency braking (AEB) as standard. 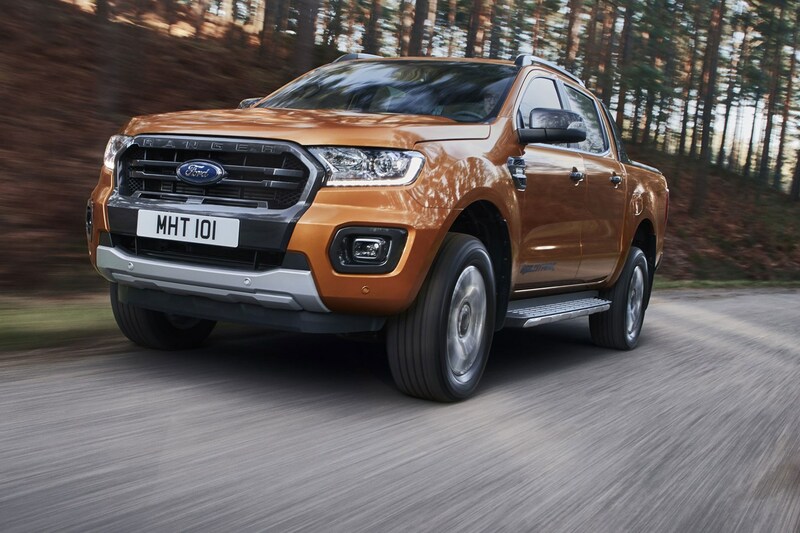 The system is called Pre-Collision Assist with Pedestrian Detection, and uses a forward-facing camera as well as radar to make the Ranger the first pickup on sale in the UK that can actively brake for people as well as vehicles. Your mates will probably be more impressed by the FordPass Connect, however. Not only does this turn the Ranger into a mobile Wi-Fi hotspot capable of handling connections from 10 devices at once, you can also access a number of vehicle features via the FordPass smartphone app. For instance, you can check the oil level, tyre pressures and mileage from the comfort of your phone, use the app to locate the vehicle, and remotely lock or unlock it – handy for allowing access should a trusted colleague need to retrieve a tool or part when you’re on the other side of a job site. Beyond all that, the 2019 Ranger is also available with Ford’s Sync 3 infotainment system, which includes Android Auto and Apple CarPlay, while for the first time keyless entry and start are offered, and the tailgate lock is now part of the central locking system. Automatic parking is available too. Any changes to the suspension for the 2019 Ford Ranger? Ford has indeed revised the Ranger’s suspension for the 2019 facelift. It assures us that this delivers ‘a more refined ride’. 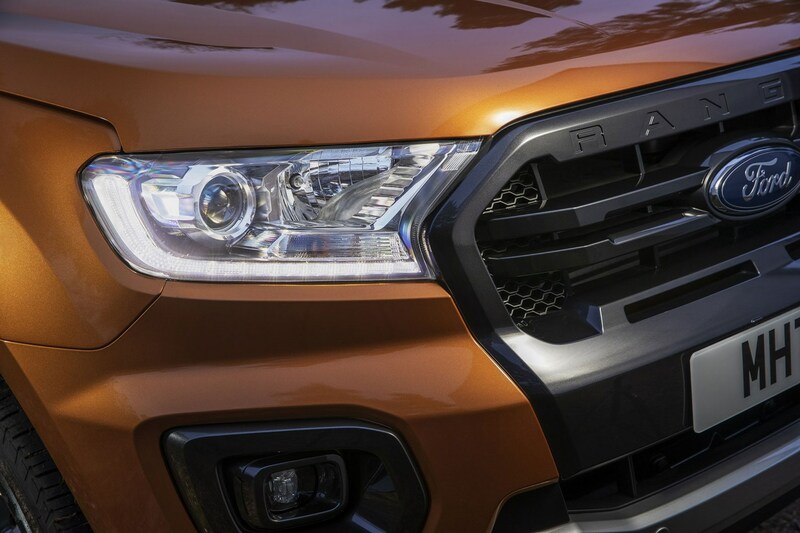 Intriguingly, Ford also says spring and damper rates have been tuned to match each Ranger variant's character, suggesting the Wildtrak may have differing ride and handling to the Limited, and so forth. We’ll be interested to see how pronounced these differences are when we get to drive the new model later in 2019. 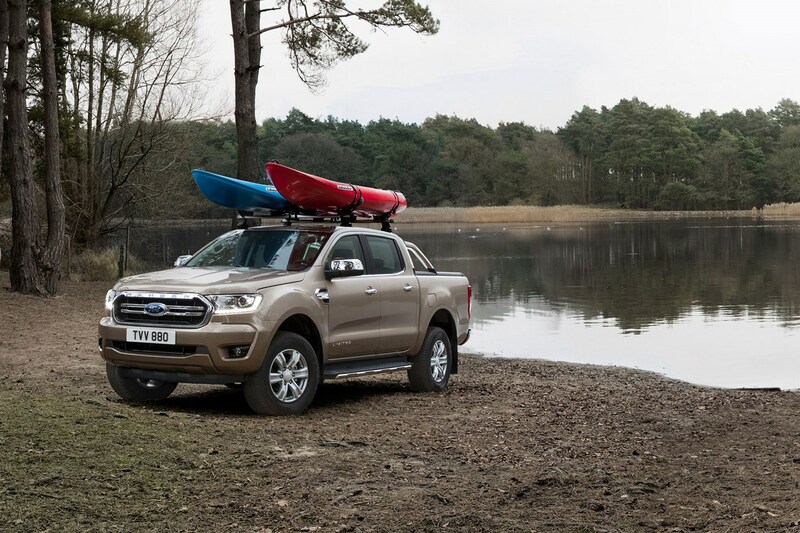 Good news: Ford has confirmed the 2019 Ranger will maintain its current 3,500kg maximum towing capacity – although expect there to be some variation on this between models. To demonstrate the potency of this, Ford has come up with a promo video that gave us a bit of chuckle in the office, so we've included it here. Maximum payload is stated as 1,252kg – which should be enough to see the Ranger maintain its status as best in class. Ford claims the wading depth is best in class, though we’re sure the various Arctic Trucks conversions available from other manufacturers will have something to say about that. When does the new 2019 Ford Ranger go on sale and how much does it cost? At this stage all Ford will confirm is that the new Ranger ‘arrives from mid-2019’. However, the official April 2019 price list includes all the new 2.0-litre engines, so we do know that prices start from £21,656 for the 130hp XL Regular Cab; the cheapest Super Cab is the 170hp XL at £23,106, with the equivalent Double Cab costing from £23,906. Ranger XLT costs from £24,056 as a 170hp Super Cab or £24,856 as a 170hp Double Cab, while Ranger Limited starts at £27,606 for a 170hp six-speed manual, rising to £30,556 for a 213hp Double Cab with the 10-speed automatic. 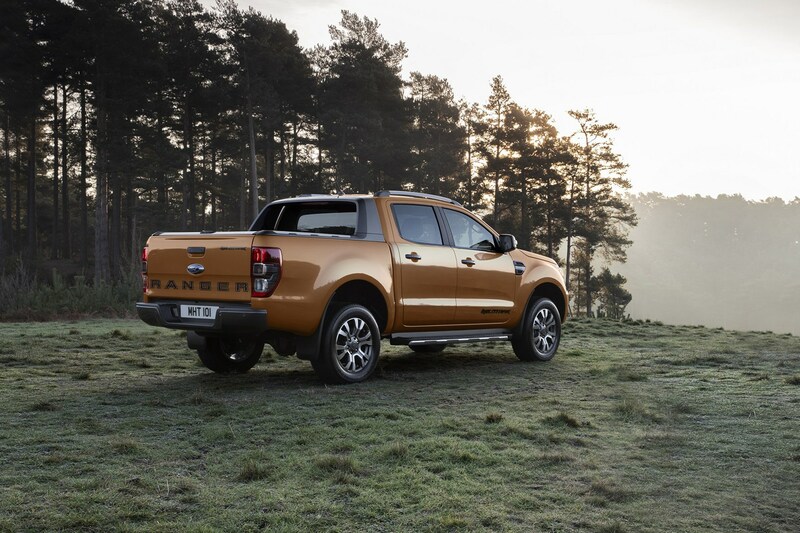 Ranger Wildtrak costs from £30,706 with the old 200hp 3.2-litre motor, and up to £32,006 with the 213hp 10-speed. Ranger Raptor, which comes only with the 213hp and 10-speed auto combination, is priced at £40,706. All figures are on the road, but excluding VAT. We’ll bring you more on the new Ford Ranger, including the first driving impressions, very soon.